There are two main methods of installing radiant barrier: stapling it up to the rafters or laying it on the attic floor. Installation methods are not based solely on where you are located; there are several factors that determine the best installation method for your home. Every home is different, so while there are general recommendations for certain climates, sometimes one method is best for a particular home. The Staple Up (also known as the Open-Ridge) method is the standard method used most often in WARM or HOT climates. This is especially true if your main objective is to reduce summer heat gain or if you have ductwork in the attic. 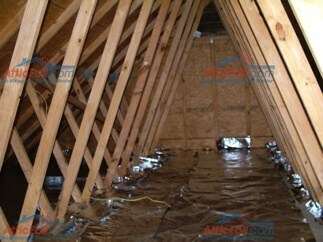 Create a green energy barrier by laying the radiant barrier foil out OVER the existing insulation on the attic floor. This method keeps heat out in summer and heat in during winter months, making it ideal for year-round benefit. Still not sure which is the best method for you? Use a simple chart to determine how much radiant barrier foil you will need for your project. Get the right tools for the right job. Here’s a list of recommended supplies you will need for your installation. Find out how to seal your recessed can lights so they are more energy efficient & air tight. Find out if the ducts in your home are leaky and if so, learn ways to can seal them back up. DIY attic installation photos from some of our customers. 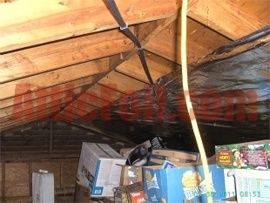 When an attic is used for storage, a staple up install method is the preferred way to go. 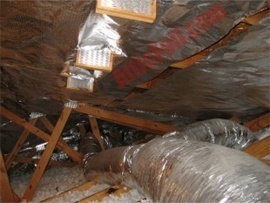 Ductwork running through the attic space is another example of when a staple up method should be used. 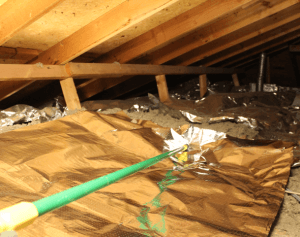 In cold months, foil on the floor of an attic helps to stop radiant heat loss from the living spaces below.